Once I was happy with her head and neck, I realized her feet were HUGE! Fitting shoes on those Sasquatch feet was going to be a challenge. 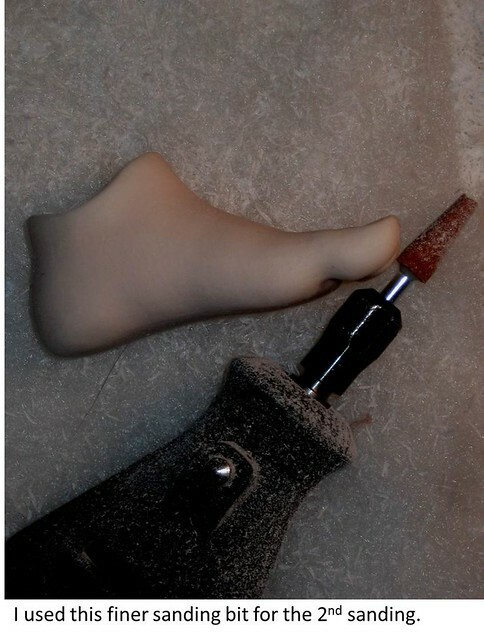 I’m no expert on modifying resin, but any mistakes I make can be concealed with Apoxy sculpt and hidden in shoes and socks, so I got bold with the Dremel drill. The feet turned out great — looking at them now, you would never know they were originally any different–and shoes fit! I took some pictures as I progressed with each tool that I used. 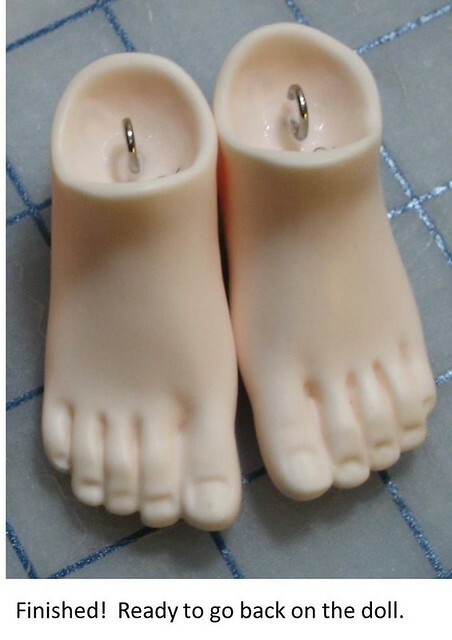 If you feel inclined to rework some of your doll feet, you may find this helpful. SAFETY FIRST! Resin dust goes everywhere. I did this project outdoors. I wore safety glasses and a tight fitting dust mask. I wore a head scarf to keep the dust out of my hair. I worked on an old towel so that I could just throw it away with a lot of the debris when I finished. The heel extends really far at the back of the foot — I’ll trim away a lot of resin there. The resin around the ankle is thick — I’ll reduce that and make the foot more slender down both sides. The outside toes are big enough that I can remove resin from their edges and they’ll still look good. I’ll take a little from the top of the foot and the arch. This bullet-shaped bit is the best I’ve found for removing a lot of resin quickly, but the round shape is less likely to make an accidental gouge. In this picture, I’ve got the new shape roughed in — all the excess resin has been removed. You can see that the surface is pretty rough. Next, there are 3 stages of sanding. 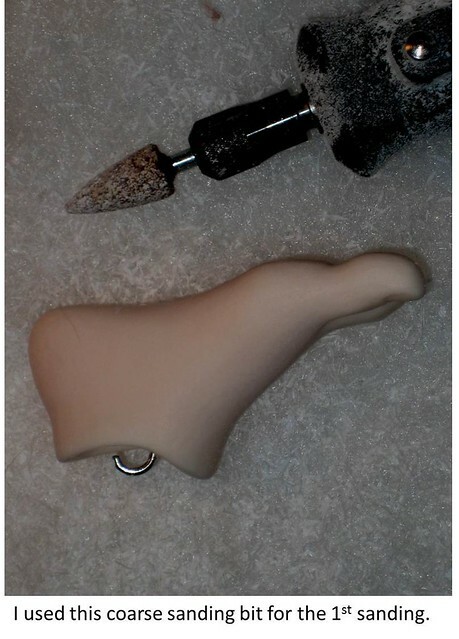 I used this coarse sanding bit to refine the shape. After this stage, the resin is rough to the touch, and there are many fine scratches in the resin from the sanding bit. For the 2nd sanding, I used a finer sanding bit on the Dremel tool. After this step, the resin is almost fuzzy. 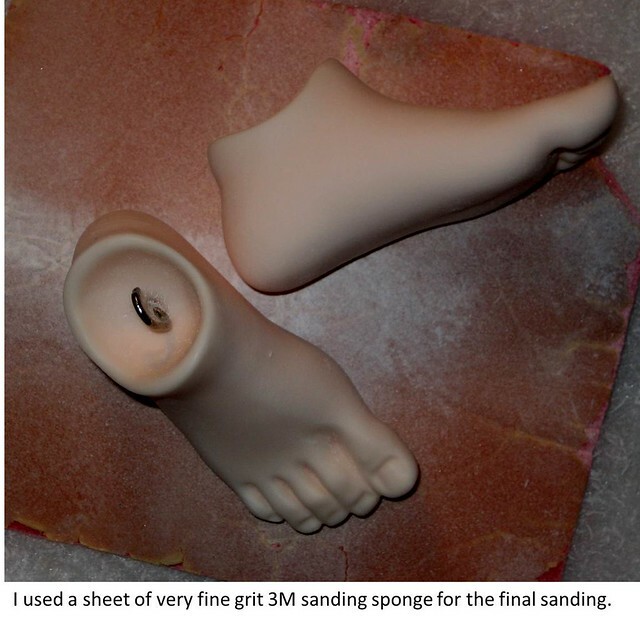 For the final sanding, I used a very fine 3M sanding sponge. After this step, the resin is smooth and there are no scratches. The resin has a soft, buff finish. For the final step, I buff the resin with a hard-felt polishing bit. After this step, the resin has a nice sheen and matches the rest of the doll. The bit gets bogged down with resin dust and it can be freshened by running it over sandpaper periodically. All done! 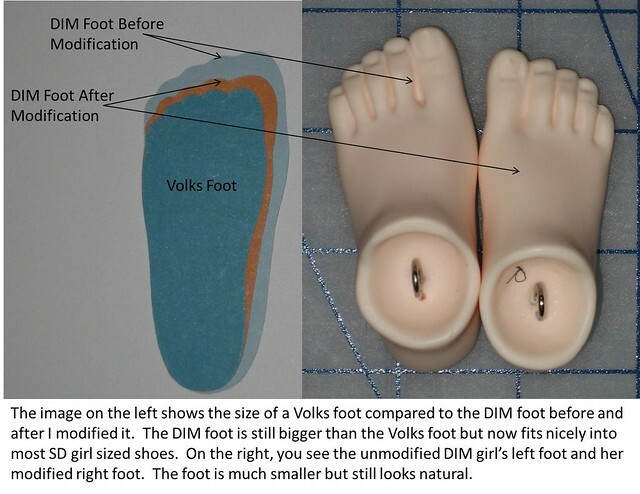 Look at the difference — the modified foot is still bigger than the Volks foot, but it is significantly smaller than it was, and it fits into all standard sized SD girl shoes. Ready to go back on the doll! 15 Nov	This entry was published on November 15, 2013 at 10:40 am. 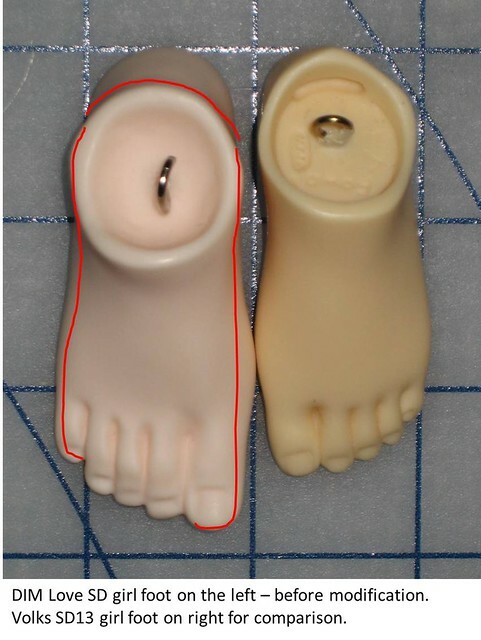 It’s filed under Doll Making, Modifications, Tutorial and tagged ABJD, Ball Jointed Doll, BJD, Doll, Doll In Mind, modification, Resin, Robbin Atwell, Tutorial. Bookmark the permalink. Follow any comments here with the RSS feed for this post. You’re amazing and inspiring. Regretting tonight selling my tan Angel of Dream body. My Elfdoll Ruru looked so cute on it—even if it was a shade off. Wow, you did an amazing job on these mods — never would have guessed that the feet weren’t original, by the time you were done! I think several of these came in “value packs” with lots of items for a special price so watch for those deals. Hope this is helpful!!! Thanks, Robbin! That is really helpful, and I will keep an eye out for the packs! 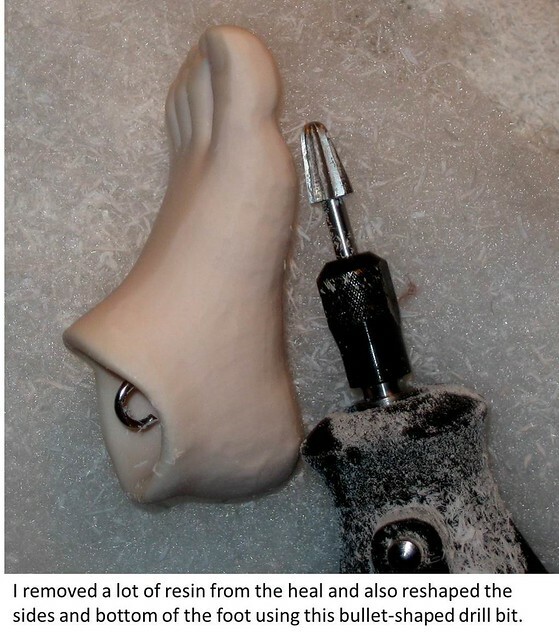 I appreciate knowing where to start — I’ve been looking for a good resin-buffing tool for a while, because it would be great for things like restoring the surface after seam-sanding, but nothing I’d tried was giving results like this. I really like these for fine-detail sanding, because it leaves a nice smooth surface — but it still isn’t quite fine enough to do polishing work. That looks great for sanding! I put some in my cart and will give it a try. Thanks for the tip!! !